Graduated from Bachelor in Agribusiness and has obtained her MBA in Shipping & Logistics of Middlesex University Business School, London. She is a Chartered Member in Logistics and Transport conferred to her in 2015. An active member of the International Association of Port and Harbours (IAPH) since the year 2000 and the current Chairperson of IAPH Women’s Forum. 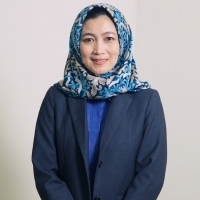 She is also the Chairperson of Women in Logistics and Transport (WILAT) for Sabah Chapters. An active member promoting maritime and logistics industry as a choice of career.